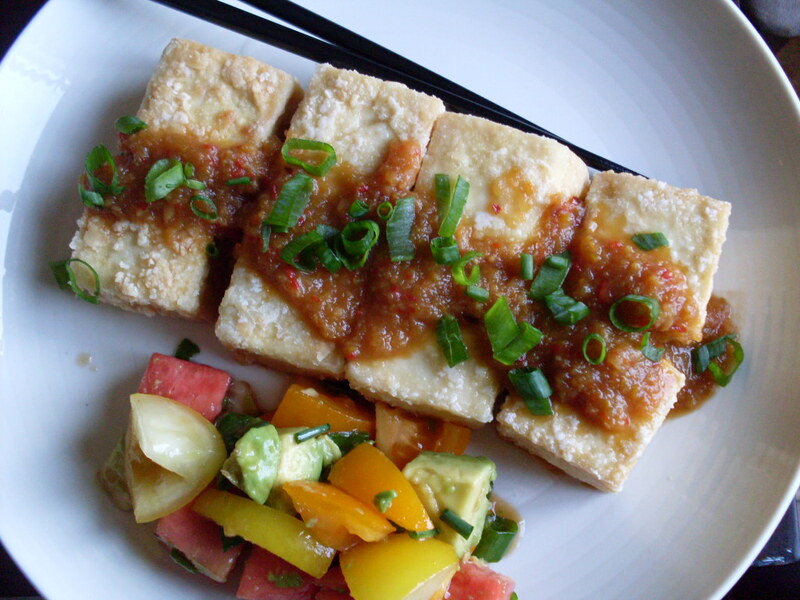 Meatless Monday: Fried tofu with plum sauce and some rambling. You see those pretty things? 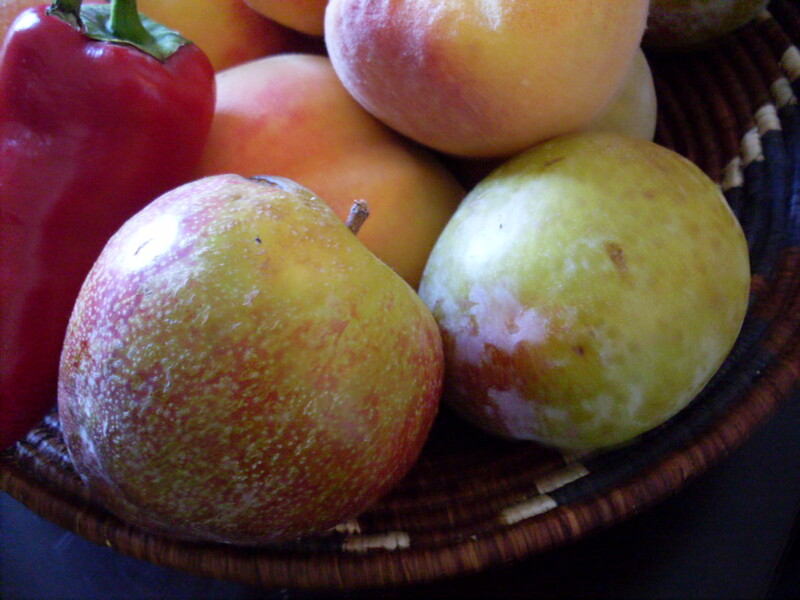 I think they’re pluots. 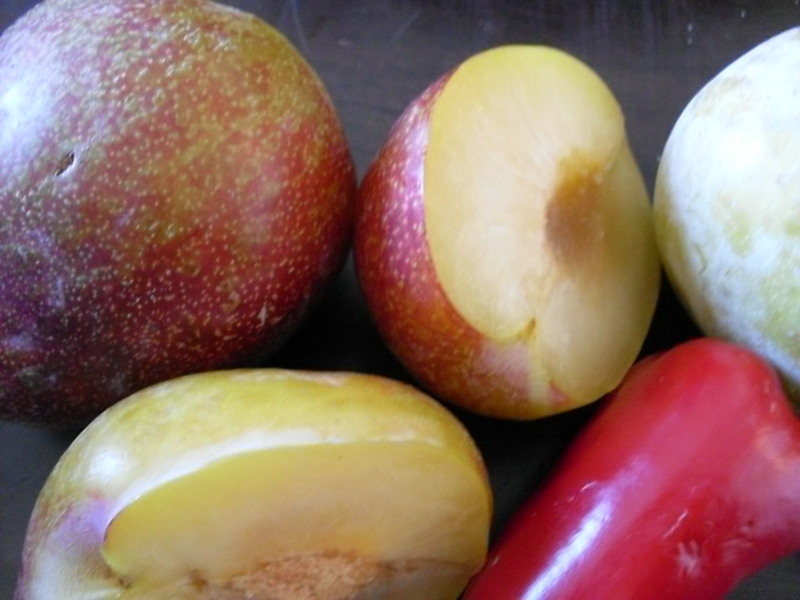 I bought them from a place that labeled them “dino egg plums,” which is why I bought them, but I’m pretty sure they’re pluots. I’ve misidentified produce before, however, so please correct me if I’m wrong. But that’s really not the point. The point is that today was incredibly challenging, with the temperature of my office soaring to an inhumane degree (which is to say somewhere over 30°C), the servers at work having exploded leaving me with literally nothing to do, and with coming home to disappointment – though, I saw it coming. A proposal I had submitted for a book was declined, which I sort of expected because it was not the book I was sure of three months after pitching the thing, but still. Allowing delusion to take the place of rational thought has always served me so well, and I had convinced myself that within a year I would be a famous food writer and then the Food Network would offer to throw Guy Fieri off a bridge and invite me to live with Ina Garten if I’d just give them a late-night cooking show on which they’d allow me to swear. But it’s okay. I wasn’t sure of the thing after the fact, and it’s not a cookbook that I really want to write. I have an idea though. I’ll keep you in the loop. I’ll try not to forget. But anyway, it’s Meatless Monday, and I’d best not let the heat lead my mind to wander, because this beer is hitting me hard and in a few short paragraphs I could forsake the recipe entirely for an unsettling peek into my soul or for a photo I’d surely regret. My goodness, it’s hot. But dino egg plums. They are what’s really important. In a small pot over medium-high heat, sauté onion, red pepper, ginger, and garlic in oil until all have begun to sweat and their smells have co-mingled. Pour the sweaty mess into a blender or a food processor, add the plums, and set the thing to spinning until the fruits and veggies are puréed. Pour back into the pot. Taste the sauce at this point, and add the sugar in carefully, a little less than is called for at first, adding more as needed. Stir in soy sauce, apple cider vinegar, and chili flakes, and allow to simmer over medium-low heat for 15 to 20 minutes. Meanwhile, fill the bottom of a large, nonstick pan with oil, about a half-inch deep. Heat until shimmering. Cube tofu, cutting into roughly 16 pieces. Whisk the egg, sriracha, and soy sauce thoroughly, and dredge the pieces in this. 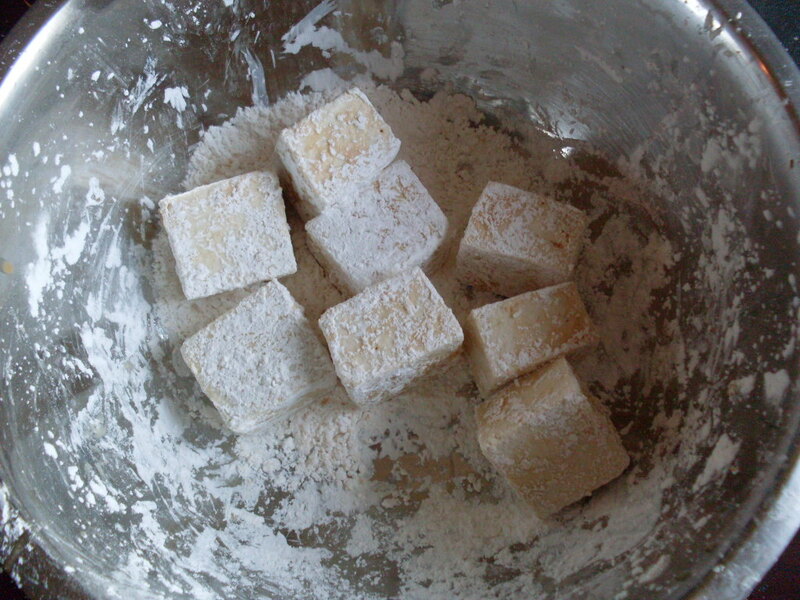 Place them in a large bowl filled with the cornstarch, and toss to coat. Place cubes of tofu in the hot oil and cook until their one side has achieved a gently golden hue, two to three minutes. Turn and cook the other side for a similar amount of time. Serve hot, with plum sauce, possibly with chopped scallions if you have them, or minced shiso leaf, which is more elusive but worth the search. Oh! If you have leftover sauce, which you may because two cups is a lot of sauce, the sauce keeps well in a sealed jar in the fridge, and you can use it for all manner of things. It’s good as a dipping sauce, but it’s also nice with pork, or even with cheese and crackers. < Previous Chocolate zucchini cake: It’s outrageous! Next > Get yogurt, make cheese. What would you suggest in place of eggs to veganize it? Soy yogurt (thinned with a bit of water), or something with a neutral taste but thicker, clingy texture, such as the vegan equivalent to mayonnaise (thinned with a bit more water) should do the trick. A favorite dish. I’ll have to try it your way — after an initial, disappointing plum this season, I haven’t bought more of them this year, and I SHOULD. No, no, no, Emily, you do not get away without telling us what’s in the salad alongside. Boy, that looks good. Thanks, Lara! I think I could overlook their schmoopiness for her roast chicken though. Plus, she makes a mean cocktail. Linda: The salad is really simple – equal parts tomato, watermelon, and avocado, with scallions, and a dressing of sesame oil, mirin, soy sauce, and sriracha. So refreshing! Ah, sorry for the let down. I am sure Ina’s guest bed is very comfy, but you might have felt like a third wheel, since she and her husband are so cozy & romantic with each other all of the time.